Mommy Jane loves to eat Thai food. Thai food is one of the most popular cuisines in the world and is liked for its distinct and strong flavours. It is both healthy and tasty. Using lots of green vegetables and herbs, it is a blend of sweet, sour, bitter and salty flavours. Because of the fondness for Thai food, Mommy Jane will always in search for the best Thai food at Klang Valley. Last weekend, Mommy Jane was introduced with an authentic Thai food at Streat Thai, Jaya One by Kak Hanny who is Mommy Jane's blogger friend. When me and my Little Angels reached there at 2.30 p.m., the restaurant was still packed with lots of customers. Whenever Mommy Jane look out for new food to try out, Mommy Jane will ensure the restaurants are pack with patrons which means that the food is delicious. Mommy Jane was assure that I had found the right place to review my Thai food here. Streat Thai is a unique place to dine in as you can see, there are a number of stalls serving a variety of noodles, Thai salad, stir fry dishes, bbq and desserts. All stalls which include drinks are stationed by Thai cooks. Streat Thai are pork free and only serve Thai dishes that does not use pork. They do not serve any Thai dishes which requires pork because they do not believe in substituting pork with other proteins as it does not taste the same. Streat Thai had more than 100 dishes at their menu for you to choose from and now, to further enhance the menu, they introduce new dishes at their menu. Mommy Jane was here to review the new dishes at the menu. We start with the appetiser. Som Tam Platter which is Thailand's most famous salad. Tamarind juice, lime juice, cucumber, carrot, glass noodles, crab meat, eggs, crispy chicken skin, string beans and a handful of grated papaya are tossed in the krok (som tam thai). It is sweet, salty and spicy flavours paired with crisp crunch of papaya is utterly luscious. The super crispy and not too oily Crispy Fried Chicken Chop with Rice is my Little Angels favourite. They love the way they marinate the chicken chop. One of the most famous and sought after Thai dishes is Thai green curry. Green curry paste, coconut milk, bamboo shoots, chicken, Thai basil, Thai eggplant and the ever present herbs and roots of Thai cuisine that make this curry an unforgettable blend of delights. Best to have it with a place of rice. If you love seafood, then you have to try this spicy and sour dipping sauce that is packed full of flavour and sure to spice up your seafood meal. With big Tiger Prawns, La La and Squids, be spoilt with the freshness of the meat. The taste and the ingredients are different than the normal that we had. Not too spicy and my Little Angels love it. With mince meat, prawns, squids, won ton skin, half cooked egg and when you mix it together, you'll love the taste of the Streat Thai Tom Yum Noodles. Combines with the fragrance of the banana leaves, Seafood Otak-Otak is perfectly steamed with brightly flavoured with various aromatic herbs, exotic spices and infused with the sweetness of the seafood. Besides all the new menu for the chicken dishes, Streat Thai also introduced some beef dishes. Since Mommy Jane don't take beef meat since birth, I didn't had the chance to taste it but hubby loves it so much. According to the manager, you can choose to have chicken or beef for all the dishes in their menu. There are lots of food which is non-spicy that are suitable for children too. A fantastic way to enjoy our meal, we had Mango Sticky Rice. A small bed of super glutinous rice is place with some slices of super sweet, non-stringy and ripened mango. Adding to the deliciousness is a drizzle of coconut cream syrup. Instead of Red Ruby, we have Green Ruby with Coconut Milk, It'a a simple concoction of greed jellies floating in a pool of sweet and cold coconut milk. The ruby which was made from water chestnut cubes coated in tapioca flour. It is sweet, creamy and refreshing. For drinks, do check out their refreshing Green Tea, Fresh Thai Coconut and Fresh Coconut Smoothie to make your thirst gone. Streat Thai is located at Jaya One, 100-G.001, The School, No. 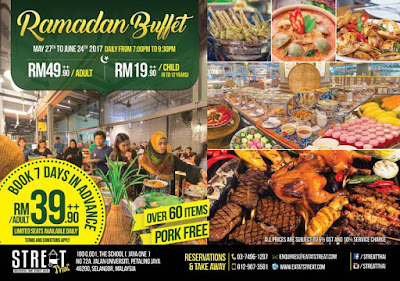 72A, Jalan Universiti, Petaling Jaya, 46200 Selangor. 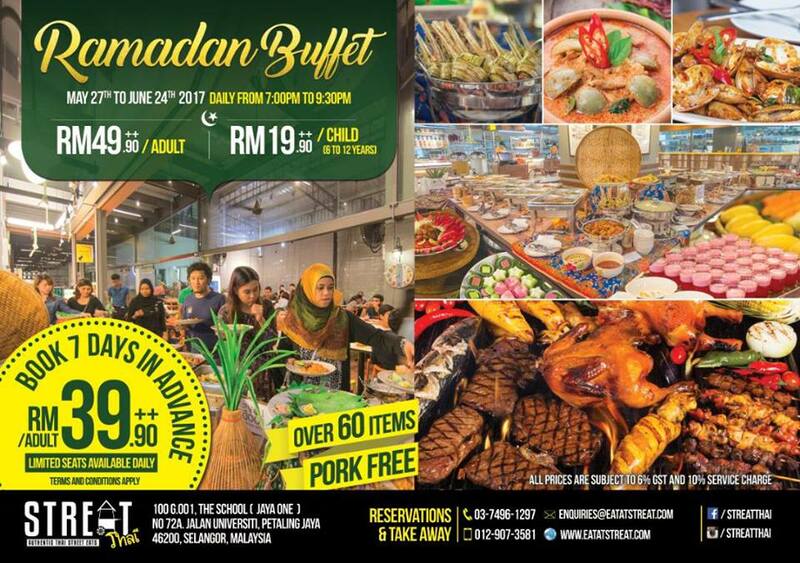 For reservations, do contact them at 03-74961297/0129073581. For more details, do check out their website at www.eatatstreat.com. Follow them at their facebook page too at www.facebook.com/streathai and instagram at www.instagram.com/streathai. The food here was indeed delicious. My Little Angels love it too especially the green curry chicken, otak-otak, trio seafood, mango sticky rice and the green ruby. Using the freshest ingredients and herbs, Streat Thai had the best authentic Thai food that had became one of my favourite place to dine-in now. We definitely will be back again for more Thai food in the menu. Great Thai food. The seafood otak-otak looks delicious. Linda, really nice. You should try it out too. Sherry, really nice and l'm sure you'll love it too. I haven't tried Thai food. I wanted to enjoy these. Mhownai, enjoy your Thai food at Streat Thai. Oh my, I love sticky rice so much. It is good? Zayani, really good. The mango is so sweet and my Little Angels loved it so much. CHUEN, the place big and always packed with customers to get the best Thai food. Miera, perhaps you should try it out. The food was indeed delicious. Rane, l'm sure all of you will like it. Mango sticky rice is tempting to try out. My favourite everytime I go to Thai stall. Ita, me too. A must to hv food at Thai. Wow, I miss Thai food. I will go and try this Thai food. Betty, l'm sure you will love it too.